“Having installed Optoma projectors in many other projects, we know they deliver high quality imagery while being reliable and cost-effective. We knew they would deliver the team’s ambitious vision within the budget without compromising quality or reliability." Merlin Entertainments, the creators of Madame Tussauds, The Dungeon, SEA LIFE and LEGOLAND® Discovery Centre, had visions of a brand new attraction in Germany that shows Berlin’s epic history in an exciting and engaging way. 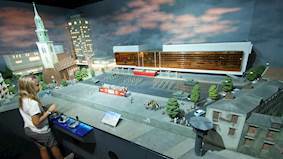 This would see a series of 3D interactive miniature sets brought to life with captivating sights, sounds and special effects. It would take visitors on a journey through time from medieval Berlin, the industrial age and the Weimar Republic, to WWII and the post-war period. Each display reveals a captivating story from that era. The video and audio equipment needed to be discretely installed in and around the models but create a gripping effect on visitors as they move through the attraction. As access into the models would be restrictive and problematic both in terms of physical access and the maintenance time available, it was imperative the equipment was reliable and needed minimal maintenance. Little BIG City was lovingly crafted over 30 months. The team used architectural drawings, photos, Google street view and cutting edge software to ensure everything was drawn to scale. For the buildings, each part was crafted individually out of 3D printed plastics, machined acrylic, plywood and MDF, cut to a tenth of a millimetre. Larger buildings were created using Fused Filament Fabrication which builds up thousands of layers 0.2mm at a time to create giant structures. The model makers and carpenters then assembled all the pieces, weathering them to make them appear time worn, before handing them to the painters. Then came the characters. Little BIG City is home to 5000 characters and 356 cats and dogs. Each character was carefully researched, dressed and brought to life each with their own professional stylist, from the makers of Madame Tussauds. This usually took between four to seven hours to make each, although some of the more lavishly dressed characters took over ten hours to craft. They are created through 3D digital body sculpting and dressed using digital clothing design software. Starting as powder, compressed at a scorching 173 degrees, they take 24 – 30 hours to 3D print before being sent to the hairdressers for quick blow dry and to the painters to be individually hand painted. Merlin appointed Figment Productions in collaboration with AV experts, Fusion to oversee the design, creative and lead the project team in partnership with Merlin’s creative team, Delta Audio, MDM model makers. 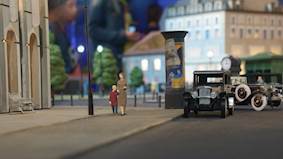 With around 100 speakers, 36 projectors and 15 screens set in and around the models, Little Big City immerses visitors in the sights, sounds and stories of Berlin from the thirteenth Century AD to the present day. The journey through the miniature city is self-guided and each scene has an individual show. 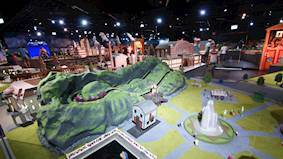 The welcome show for the attraction gives the illusion of the city shrinking which introduces the concept of the miniature sets. Imagery was blended to wrap around three sides of the 8 metre square room using five Optoma ZU400USTultra short throw laser projectors. This relatively small room would have 25 people on the tour, so the projectors needed to be installed close to the walls so there are no shadows. 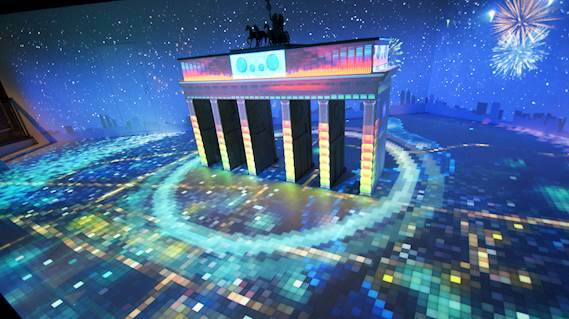 Visitors walk through the projection into the main attraction and meet their narrator who is rear projected above the model atop Berlin’s famous Brandenburg Gate. This uses two Optoma EH200ST short throw projectors beaming onto a transparent surface with projection film. These units had to be bright and punchy to show clear imagery on the glass. 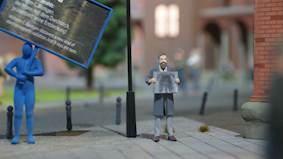 The display creates a ‘Lilliput effect’ as visitors feel they are shrunk down to his size as they continue their journey through time. They walk through medieval construction sites and torture chambers, through industrial production lines at the turn of the nineteenth centre and Burlesque Shows from the Weimar period. The burning of the Reichstag in 1933 was a pivotal moment in the country’s history leading to the rise of Nazi Germany and WWII. This had to be a spectacular showstopper. Seven projectors were used in this area - two Optoma ZH400USTultra short throw laser, two Optoma ZU510 laser projectors and three Casio XJ-A257 projectors. Amid the smoke and noise, there is interpretative text in both German and English that explains how a saboteur set the parliament building alight which galvanised the people behind the Third Reich. 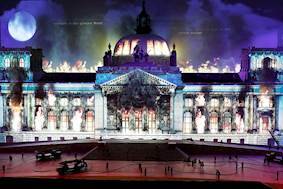 Optoma’s bright 5500 lumen laser WUXGA ZU510 laser projectors were chosen for the main display and blended across the Reichstag. Visitors are then stood in the middle of the largest ever bombing raid in WWII. An eight metre wide projection shows bombers racing towards them, search lights swing around the room and air raid sirens raise the alarm. It ends with them stood among the ruins of Berlin. Two edge blended Optoma ZU650 laser projectors with wide angle lenses are used for the display. The Cold War sees a divided city. 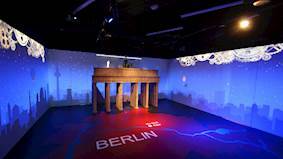 Using more laser projectors from Optoma, the attraction shows the “Berlin Airlift” when allied forces dropped essential supplies to the population in the western side of the city and JF Kennedy delivering his famous “Ich bin ein Berliner” speech. This display reflects the humour woven throughout the whole attraction as JFK’s character is stood next to a donut stall (A Berliner is the German word for donut). The interactive display of the Springer building, the publishing house responsible for Das Bild and which facilitated messages across Berlin during the Cold War, uses an Optoma ZU510T laser projector in portrait mode to project imagery onto projection film. Visitors can cycle through newspapers that were printed at this time. They can then go on to push over sections of the Berlin Wall, under the watchful gaze of David Hasselhof, which triggers fireworks. 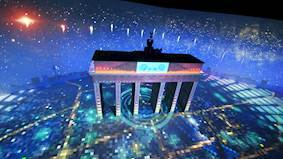 The finale shows modern Berlin on Millennium eve and feels like you are looking from an airplane window onto the Brandenburg Gate. 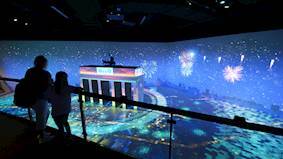 Content is projection mapped onto the miniature sets and buttons trigger a spectacular firework sequence that explodes across the 12-metre wall. This happy new year finale is powered by four edge blended Optoma ZU650 laser projectors on the front wall, two ZH400UST projectors rear projected on the back wall and two ZU510 projectors blended on the floor behind the walkway to create a completely immersive experience. The final scene ends at the TV Tower which is the real view visitors see as they exit the attraction. 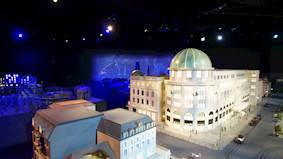 The attraction used state of the art techniques not just in the lighting, sound and interactive AV technology but also within the model making. Fusion, experts in AV design and installation within the museum, heritage and leisure industries, put forward the equipment that would deliver the designers’ visions for the displays and how the stories would be told. Ian Carling from Fusion said: “Having installed Optoma projectors in many other projects, we know they deliver high quality imagery while being reliable and cost-effective. We knew they would deliver the team’s ambitious vision within the budget without compromising quality or reliability. All AV feeds back to a centralised control room. HDBaseT was used to send the signals to the laser projectors. The technical team at Little Big City are able to monitor the equipment over the network and control this at the touch of button. Fusion also offers support and can log into the system and reboot remotely if needed. PJ Link commands turn the projectors on in the morning and off in evening. Based at the foot of Berlin’s iconic TV Tower, Little BIG City opened on 1 July and invites visitors to experience 700 years of the city’s history. Using mostly visual content rather than text, it reveals the most epic events that shaped the city from the moment it was born right up to the modern day. It is already proving popular both for tourists and educational visits from school groups. With a highly talented team of designers, film-makers, 3D artists and software developers, Figment Productions produces film and video, CGI and bespoke interactive software for a multitude of projects. With offices in London, Dubai and Qatar, Delta is a leader in design, rental and engineering of audio, communications, technology systems and solutions.